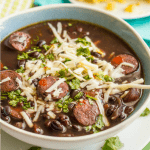 Slow cooker black bean chorizo soup is an easy-to-prep dinner with deep, rich flavors - perfect for a cozy night in! Add everything but the chorizo to the slow cooker. Meanwhile, heat a large skillet over medium-high heat. Brown the sausage on both sides, about 5 minutes total. After 8 hours, remove the bay leaf and ham hock from the soup and discard. Use a potato masher and lightly mash the beans. Add the seared chorizo to the soup and stir to combine. Cover and cook on low for an additional 45 minutes to let the flavors combine. Taste and adjust seasonings and serve warm, with desired toppings. Ham hocks are a Southern favorite for flavoring soup, especially on a budget. If you can’t find any, you could substitute chopped salted pork, chopped smoked bacon or chopped smoked ham. I prefer the black beans partially mashed after they have cooked. I think it gives more texture and creaminess to the soup, but you can skip that step if you prefer. If you’d prefer to use regular chorizo, cook it in a medium pan and either stir it into the soup at the very end or serve the soup with the crumbled chorizo sprinkled on top.